Players are given a number. Each player dribbles in the designated grid and once a number is called dribbles out of grid and shoots on their goal. Even numbers shoot on one goal, odd numbers shoot on other goal. player on outside of box hold ball and acts as feeder to player behind manequin. starts with feeder passing ball to feet player inside circle passes back then turns to find another server and repeat now of the other foot. server dribbles ball around cone and back in then repeats as above. 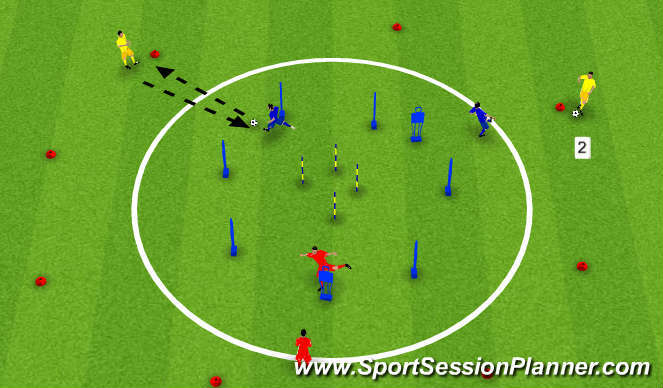 2. players now once passed have to touch a pole then change direction to find another server, server dribbles ball around cone as above with ball between feet ( lots of touches) on balls of feet. 5. players now do 1 volley streching out so that foot is above hip hieght on finish turn out go through poles then find another server using other foot. 7. players now head the ball and on landing imediatly turn and find another ball still be behind manequin. Same field as the "Line Soccer" game, a wide, short field. teams can score in one of 2 ways.